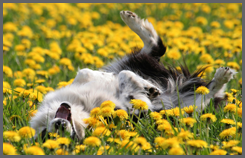 Choose a holistic system that treats the physical and emotional problems of your pet. 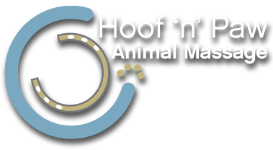 Hoof 'n' Paw Animal Massage offers a wide variety of animal massage services to keep your dog or horse in the ideal physical condition, including acupressure, trigger point work, fascia work, and cold laser therapy. All of our treatments are done in the comfort of your own home or barn, and everything is available at affordable prices. Learn more about our extensive services and how they help improve your animal's well-being. Whether you have an aging dog who suffers from arthritis or a horse that needs specialized competition prep, a massage is a great way to relieve pain, lessen muscle soreness and ease symptoms. Call today to receive your initial assessment — which normally costs $10.00 — for free. When it comes to horses and dogs, Hoof 'n' Paw Animal Massage provides a balanced approach to good health. For more than eight years, we have been offering a unique combination of treatments to enhance your pet's well-being. Located in Colorado front range area, we are dedicated to improving the day-to-day life of animals by eliminating their pain and helping them heal. With the help of our skilled massage therapist, your dog or horse will be happier and function better. Robin Freeman is the founder and the main therapist associated with our company. She is a highly-trained professional and a Certified Colorado Animal Massage Therapist and Acupressurist who studied at the Rocky Mountain School of Animal Acupressure and Massage. This dog and horse massage therapist is also an animal advocate who always is looking for new ways to improve the lives of those four-legged friends around her.